There’s Nothing More Rewarding than Giving Back and Making a Difference in the Lives of the People in this Great Community. We as REALTORS have a special way of communicating with people, that’s what we are best at. We know how to reach out to those in need and we find great joy in doing so. It isn’t for the win, it isn’t for the notoriety, it is really about that one special moment of knowing you, your team and your community rolled up your sleeves and helped so many in need. That’s what this is about and it truly is wonderful. I know that when we get together to do something this big there are challenges and there are always ways to improve. We truly do want to make this an incredible success year after year and I encourage you to give your opinion and feedback that will help make this an amazing event. With that said, I want to personally thank each and every one of you for your participation and support in this great cause. Please see the some important changes and details outlined below. Please Note – There is a change in venue for the breakfast. We will be having the Main Event on November 8th at The Lantern House in Ogden. This event has grown from 15,570 items in 2013 to 341,165 items in 2017 and we anticipate this year to be even bigger. We really are trying to get the publicity that this event deserves. As you know, that can be a challenge these days, but the more participation, social media posts, “likes and shares” of the FB event page, personal marketing etc…will surely get that attention. 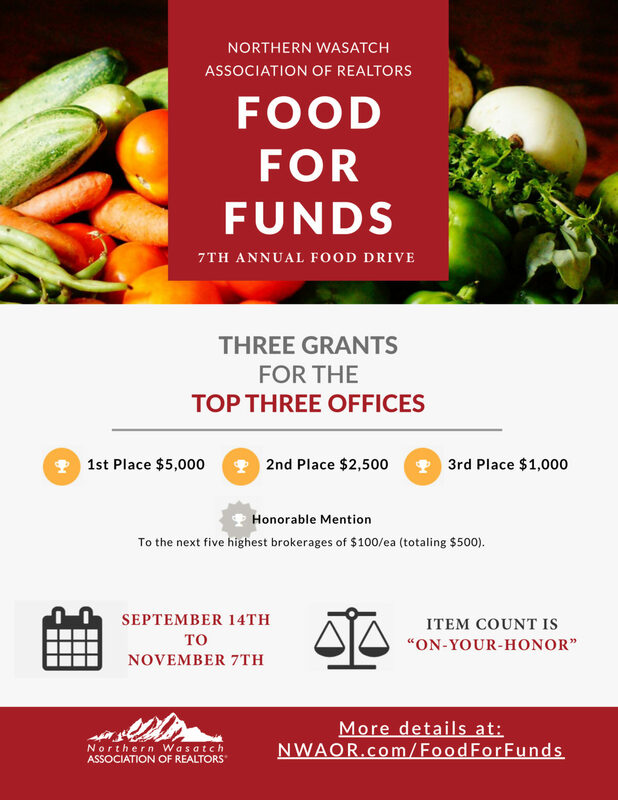 There are a couple of tasks that I ask of all of you to help spread the word and bring more awareness to NWAOR’s Community Outreach Committee and the Food For Funds Drive. Please invite your Facebook friends to “Like” our page. Community Outreach Committee – NWAOR. 1. All brokerages can participate. Even if they don’t try for a grant for a charity of their choice. 3. Choose your grant recipient: All details are outlined below under “Grant Participation” or go to www.nwaor.com/foodforfunds. 4. The name of the drive is Northern Wasatch Association of REALTORS 7th Annual Food For Funds Drive. 5. You can do a drive for anything you want: food, coats, boots, hygiene items, blankets, gloves… It all counts so encourage them to participate in any way that works for them. 7. Take lots of pictures, share, tag etc…on NWAOR Food For Funds Facebook event page. **Remember, We will have a backdrop for photos that you can use for photo opportunities. 8. We encourage and appreciate participation in our Big Event at The Lantern House in Ogden on November 8th. Choose Your Grant Recipient and Email Shayla@NWAOR.com so she can make sure you are on the email list when she sends reminders for your final count. If you don’t let her know you are participating for the grant you may get missed in the final count and that would be unfortunate. The brokerages with the most item points wins! Grants will be awarded to the top teams collecting the most items.